Summer 2015 sees the release of the first limited edition run of official Spokenforks apparel; the result of a collaboration with professional kit manufacturer Kalas. Available in both Men’s and Women’s cuts, the jersey is constructed from fabric which utilises carbon fibre to create a more lightweight and aerodynamic surface. With elongated sleeves and mesh panelling in key areas, Kalas ensures comfort and performance is guaranteed whenever working hard on the bike. Other features included on the limited edition jersey are a three-compartment rear pocket, full length concealed zipper providing continuity of design and an inner removable water-proof pocket to keep your valuables safe. For more information regarding the Spokenforks kit, including how to order yours, please click on the sidebar to the left. The Dolomites now loom large upon the horizon as the riders have to face up to the monstrous climbs which now appear before them in the midst of 2016’s Giro d’Italia. We expect to see the first official exchange of blows amongst the real general classification favourites here, but whether such skirmishes will decide the day’s winner is still a tough questions to answer. 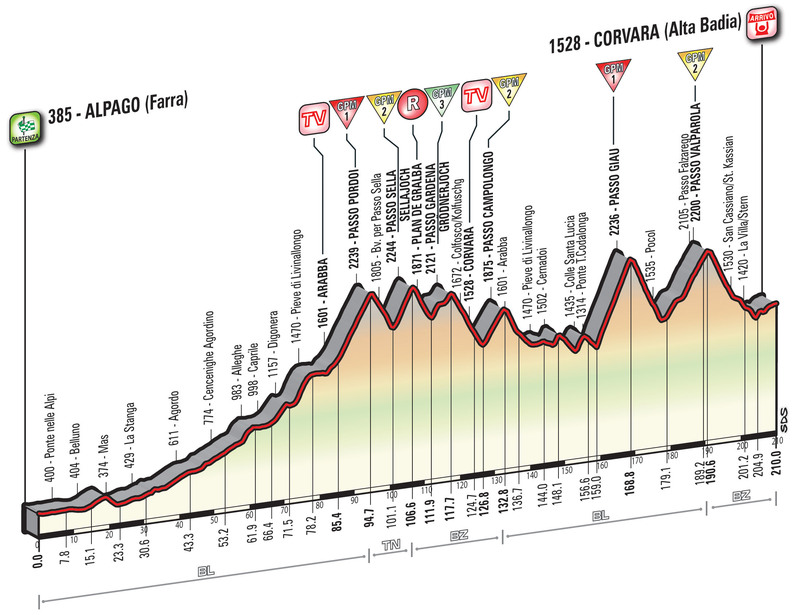 A potent mixture of six climbs, comprising three Category 2 ascents and a further two Category 1 climbs, Stage 14’s 210km affair from Alpago to Corvara looks gruelling. Esteban Chaves has dropped hints of his form thus far, but we have not really seen the wide smiling Colombian truly drop the hammer, making Stage 14 an enticing prospect to watch Chaves attack his rivals with both barrels. Talented on the steepest slopes, both uphill and downhill, Orica’s captain here stands a great chance of taking the stage and subsequently igniting his campaign for a podium place. Vincenzo Nibali appears to be flying somewhat under the radar here by doing the minimum required of him to stay amongst the frontrunners, but today’s draining test could be happy hunting for the Italian champion. Nibali has long established himself as the man to beat upon these long mountain days in the saddle and possesses a team strong enough to control the day in order to provide him with the opportunity to win. Rafal Majka is blessed with a general classification position currently which could afford him the freedom to attack late on Stage 14; the sort of attacks which we saw him use to secure the Tour de France’s mountains classification. The final drags up to the finish should favour the Polish rider, but beating GC men such as Nibali will be tough. Steven Kruijswijk does not seem to be attracting much attention right now despite following the very best climbers at this year’s Giro. This is the first real foray into the Dutchman’s favoured terrain and if he continues to build upon his form the harder the race becomes, it is easy to see him winning tough stages such as today. Alejandro Valverde‘s hopes of winning 2016’s Giro d’Italia are likely to be tested for the first time during Stage 14 with the Spaniard’s abilities on such tough stages often stretched to their limits. Though unlikely to go on the offensive, it seems certain that he will manage to stay in touch of his rivals and possibly negate any deficit by descending like a madman once again. Should Valverde feature in a lead bunch which comes to the line first, then there are few who can beat the Movistar leader in a sprint. Giovanni Visconti is placed nicely upon the mountains classification and is an obvious pick to make it into the break on Stage 14 during this crucial battle for the mountains jersey. Visconti even looks strong enough right now to elude the chase behind and win the stage outright. Posted on May 21, 2016 May 21, 2016 by Spokenforks	This entry was posted in Giro d'Italia 2016, News and tagged Alejandro Valverde, Astana, Esteban Chaves, Giovanni Visconti, Giro d'Italia 2016 Stage 14 Preview, Movistar, Orica-Greenedge, Rafal Majka, Spokenforks, Steven Kruijswijk, Team LottoNL-Jumbo, Tinkoff, Vincenzo Nibali. Bookmark the permalink.